WASHINGTON (CNN) -- A House representative said Thursday she is requesting an investigation after learning a CNN reporter was put on the federal no-fly list shortly after his investigation of the Transportation Security Administration. 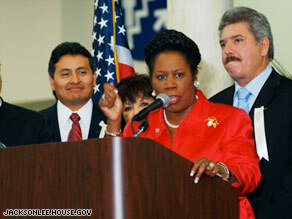 Texas Rep. Sheila Jackson Lee demanded to know why a CNN reporter's name was put on the no-fly list. Rep. Sheila Jackson Lee, D-Texas asked Homeland Security Secretary Michael Chertoff about "a curious and interesting and troubling phenomenon" that CNN Investigative Correspondent Drew Griffin was added to the list. "My question is, why would Drew Griffin's name come on the watch list, post-his investigation of TSA?" Jackson Lee said. "What is the basis of this sudden recognition that Drew Griffin is a terrorist? Are we targeting people because of their critique or criticism?" In response, Chertoff said it was "not my understanding the reporter was put on," but that Griffin may share a name with someone put on the list. "We do have circumstances where we have name mismatches," he said. Griffin learned in May he was on the list, about two months after he reported on the federal air marshals program. In a March story, Griffin reported that of the 28,000 commercial flights taking off in the United States every day, fewer than 1 percent have on-board, armed federal air marshals on board. In response to Griffin's story, TSA said on its Web site that it would not disclose the number of air marshals flying on a daily basis so as not to "tip our hand to terrorists." "The actual number of flights that air marshals cover is thousands per day," read a statement on the Web site. Jackson Lee said she was using Griffin as an example. Committee members noted during the meeting that Congressman John Lewis, D-Georgia, is also on the no-fly list and has been trying for years to get removed. "He's still having trouble," said committee chairman Bennie Thompson, D-Mississippi, showing a letter from Lewis. "And according to this letter, it's still not happening," Thompson said, "even to the point that the department gave him a letter attesting that he was John Lewis and he should be allowed to get on planes." He asked Chertoff to "find out how many other John Lewises are out there, who are having difficulty explaining to the department who they are so they can get off this no-fly list. We see more and more of it happening and I know Sen. Kennedy had a problem with it, and for whatever reason it was worked out." Chertoff said he would be "happy" to help Lewis in his efforts to get removed from the list. Jackson Lee said Griffin also attempted to provide documents indicating he was not involved in terrorism to the Department of Homeland Security. Chertoff said if Griffin has a complaint, he should go to the department's inspector general. He pointed out, however, that the database of people on the no-fly list is maintained by the Department of Justice, not the TSA. TSA spokesman Chris White said earlier this week that any connection between Griffin's reporting and his name being added to the no-fly list "is absolutely fabricated." Griffin reported earlier this week that the database has grown to 1 million names, citing the American Civil Liberties Union, which claims the list is so huge it is "ineffective" and "likely useless" as an anti-terrorism tool. Federal officials who manage the list say the ACLU's claim is exaggerated, and that about 400,000 names are currently on the list. The Terrorist Screening Center, a division of the FBI, said about 5 percent of those on the list are Americans, and most aren't even in the United States. "We strive to have the watch list contain all appropriately suspected terrorists who represent a threat to the U.S., but only appropriately suspected terrorists," the center said in a written statement. "Independent government audits have recognized our ongoing efforts to constantly check watch list data to improve quality, reduce the number of misidentifications or mitigate their effects and enhance traveler redress efforts." Washington attorney Jim Robinson, a former assistant attorney general who told CNN he is among those on the watch list, said he cannot utilize some of the conveniences of air travel, such as electronic check-in, automated ticketing kiosks and curbside baggage checks. Instead, after he checks in, he has to wait in line while airline agents verify by telephone "that I am not the James Kenneth Robinson who is the cause of my being on the watch list." The ACLU drew its 1 million figure from an October report by congressional auditors, who put the number of names on the list at more than 750,000, with another 20,000 names being added each month.